In order to use the #iplayslinky builder cookies need to be enabled. To learn how to turn on cookies please look at this informative wikihow page. 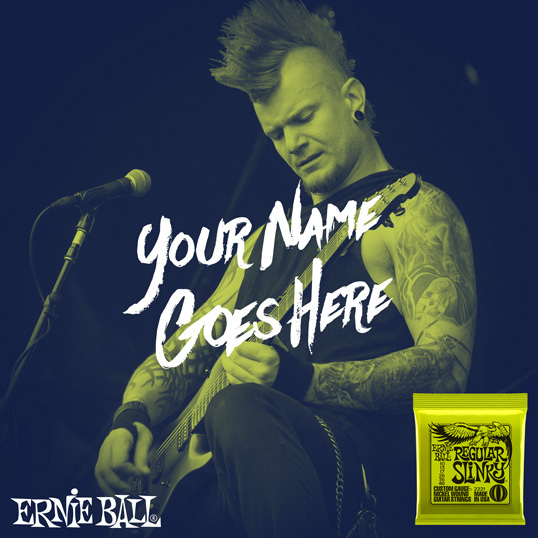 Ever wanted to have your own Ernie Ball ad? Now you can! Use our #iplayslinky ad creator to let the world know that you’ll only play the best strings. Enter your personal information and upload your picture. Use the cropper and sliders below to fine tune your image. 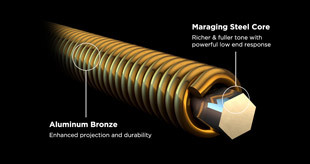 Share or save your Slinky ad. Please wait while we create your image. This could take up to 30 seconds. Tell the world #iplayslinky by sharing your image to your social networks. Your image may also appear on our site! 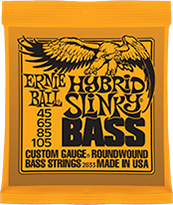 For over 50 years the Ball family has been dedicated to helping musicians find their voice by crafting premium strings and accessories. 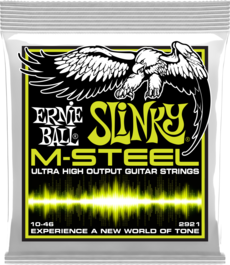 Original nickel plated steel formula for that classic Slinky tone. The most popular Slinky gauge combination since 1962. Great for rock, jazz, blues, punk and metal. 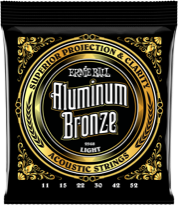 Original nickel plated steel formula, for classic balanced tone. Extra light gauge set for slinkier feel and extreme bendabilty. Great for rock jazz, blues, punk and metal. Original nickel plated steel formula, for classic balanced tone. Light gauge set for slinky feel and bendabilty. Great for rock jazz, blues, punk and metal. Original nickel plated steel formula, for classic balanced tone. Combining a slightly thicker low end for chords and rhythm with lighter top end for extra bendabilty. Great for rock jazz, blues, punk and metal. Original nickel plated steel formula for that classic Slinky tone. Heavy gauge set for an overall thicker sound. Great for rock, jazz, blues, punk and metal. 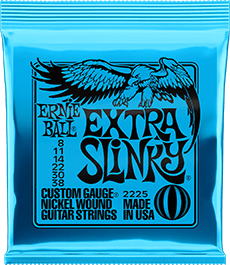 Original nickel plated steel formula for that classic Slinky tone. 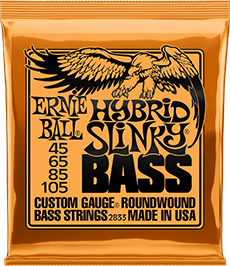 Heavy gauge set for an overall thicker sound. 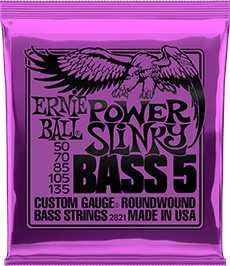 Optimal for detuning to Drop D or Drop C. Great for rock, jazz,punk and metal. 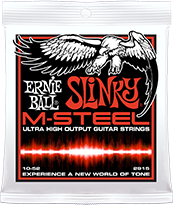 Original nickel plated steel formula for that classic Slinky tone. Heavy gauge set for an overall thicker sound. 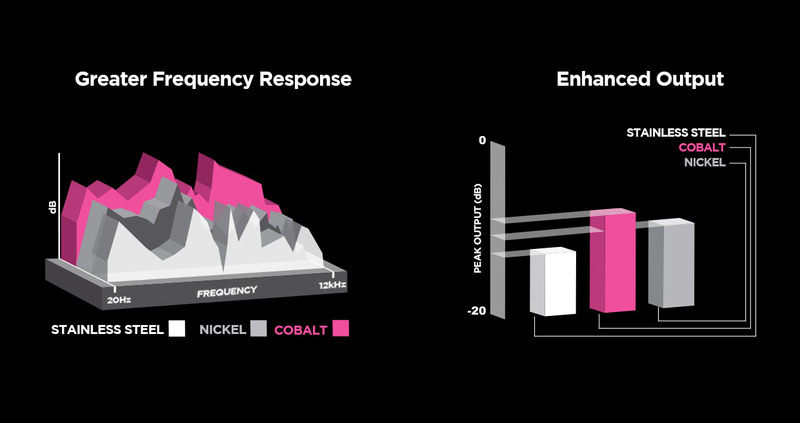 Optimal for detuning to Drop D. Great for rock, jazz, punk and metal. Original nickel plated steel formula for classic balanced tone. 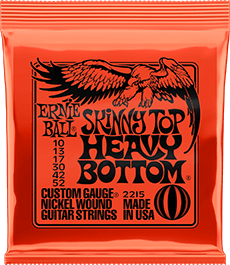 Heavier low end gauges for chunky rhythms, skinnier top for slinky feel and bendabilty. Great for rock, jazz, blues, punk and metal. Tin plated steel core wire wound with Ernie Ball's exclusive Cobalt alloy delivering higher output with enhanced clarity. 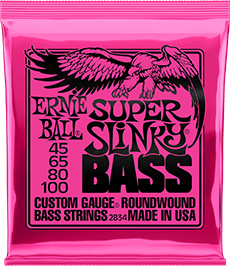 The most popular Slinky gauge combination since 1962. Great for rock, blues, punk and metal. Tin plated steel core wire wound with Ernie Ball's exclusive Cobalt alloy delivering higher output with enhanced clarity. Extra light gauge set for slinkier feel and extreme bendabilty. Great for rock, blues, punk and metal. 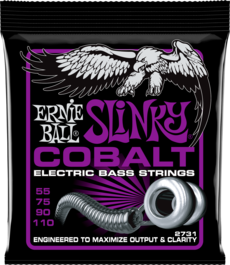 Tin plated steel core wire wound with Ernie Ball's exclusive Cobalt alloy delivering higher output with enhanced clarity. Lighter gauge set for slinky feel and bendabilty. Great for rock, blues punk and metal. Tin plated steel core wire wound with Ernie Ball's exclusive Cobalt alloy delivering higher ouput with enhanced clarity. Combining a slightly thicker low end for chords and rhythm with lighter top end for extra bendabilty. Great for rock, blues, punk and metal. 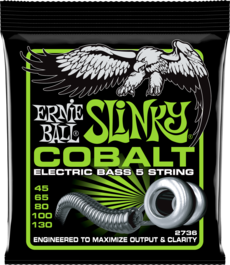 Tin plated steel core wire wound with Ernie Ball's exclusive Cobalt alloy delivering higher output with enhanced clarity. Thicker guage set for an overall heavier sound. Great for rock, blues, punk and metal. Tin plated steel core wire wound with Ernie Ball's exclusive Cobalt alloy delivering higher output with enhanced clarity. 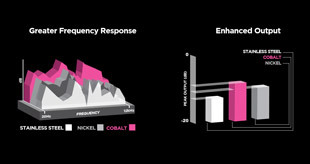 Heavy guage set for an overall thicker sound. 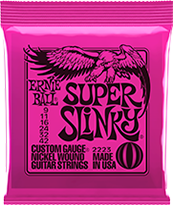 Optimal for the lowest detuning to drop D and C. Great for rock, blues, punk and metal. Tin plated steel core wire wound with Ernie Ball's exclusive Cobalt alloy delivering higher output with enhanced clarity. Heavy guage set for an overall thicker sound. 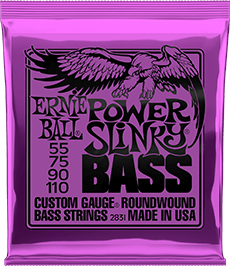 Optimal for detuning to Drop D. Great for rock, blues, punk and metal. 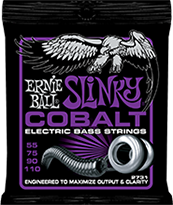 Tin plated steel core wire wound with Ernie Ball's exclusive Cobalt alloy delivering heavier low end gauges for chunky rhythms, skinnier top for slinky feel and bendabilty. Great for rock, blues, punk and metal. Maraging steel core wire wound with our exclusive Super Cobalt alloy deliving ultra high output with enhanced clarity and unmatched low end. 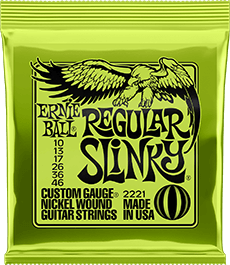 The most popular Slinky gauge combination since 1962. Great for rock, blues, punk and metal. Maraging steel core wire wound with our exclusive Super Cobalt alloy deliving ultra high output with enhanced clarity and unmatched low end. Light gauge set for slinkier feel and bendabilty. Great for rock, blues, punk and metal. Maraging steel core wire wound with our exclusive Super Cobalt alloy deliving ultra high output with enhanced clarity and unmatched low end. Combining a slightly thicker low end for chords and rhythm with lighter top end for extra bendabilty. Great for rock, blues, punk and metal. 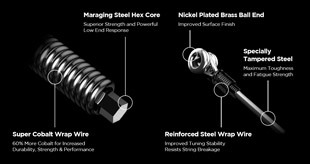 Maraging steel core wire wound with our exclusive Super Cobalt alloy deliving ultra high output with enhanced clarity and unmatched low end.. Heavy guage set for an overall thicker sound. Great for rock, blues, punk and metal. 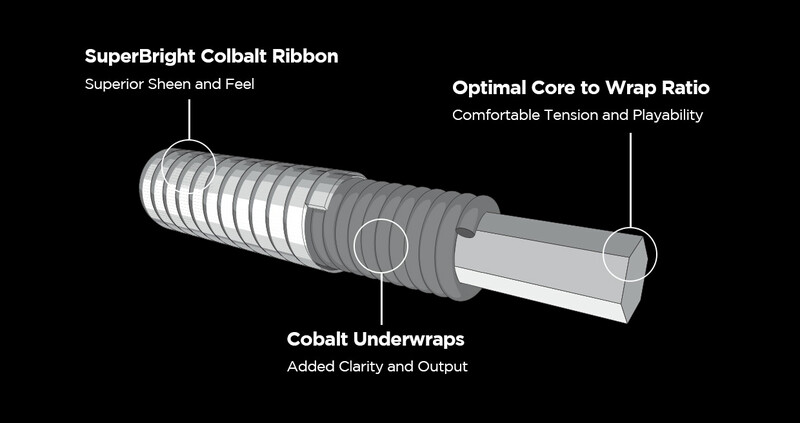 Maraging steel core wire wound with our exclusive Super Cobalt alloy deliving ultra high output with enhanced clarity and unmatched low end. Thicker low end gauges for chunky rhythms, skinnier top for slinky feel and bendabilty. Great for rock, blues, punk and metal. 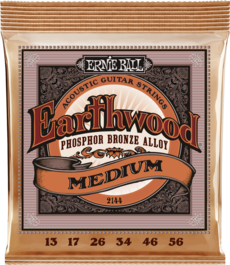 Original nickel plated steel formula, for classic balanced tone. Medium gauge set for balanced feel and playability. Great for rock, jazz, blues, funk and metal. Original nickel plated steel formula, for classic balanced tone. Extra light gauge set for slinkier feel and exceptional playability. Great for rock jazz, blues, funk and metal. Original nickel plated steel formula, for classic balanced tone. Light gauge set for slinky feel and playabiltly. Great for rock, jazz, blues, funk and metal. Original nickel plated steel formula, for classic balanced tone. Light gauge set for balanced feel and playability. 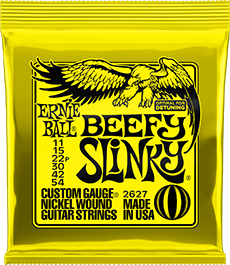 Great for rock, jazz, blues, funk and metal. Original nickel plated steel formula, for classic balanced tone. Heavy gauge set for balanced feel and playability. Great for rock, jazz, blues, funk and metal. Tin plated steel core wire wound with Ernie Ball's exclusive Cobalt alloy delivering higher output with enhanced clarity. Medium gauge set for balanced feel and playability. Great for rock, jazz, blues, funk and metal. Tin plated steel core wire wound with Ernie Ball's exclusive Cobalt alloy delivering higher output with enhanced clarity. Extra light gauge set for slinkier feel and exceptional playability. Great for rock jazz, blues, funk and metal. Tin plated steel core wire wound with Ernie Ball's exclusive Cobalt alloy delivering higher output with enhanced clarity. Light gauge set for slinky feel and playabiltly. Great for rock, jazz, blues, funk and metal. 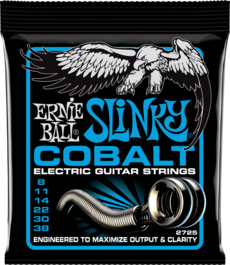 Tin plated steel core wire wound with Ernie Ball's exclusive Cobalt alloy delivering higher output with enhanced clarity. Light gauge set for balanced feel and playability. Great for rock, jazz, blues, funk and metal. Tin plated steel core wire wound with Ernie Ball's exclusive Cobalt alloy delivering higher output with enhanced clarity. Heavy gauge set for balanced feel and playability. Great for rock, jazz, blues, funk and metal. Tin plated steel core wire wound with Ernie Ball's exclusive Cobalt alloy delivering a roundwound sound with a flatwound feel. Medium gauge set for balanced feel and playability. Great for rock, jazz, blues, and funk. Tin plated steel core wire wound with Ernie Ball's exclusive Cobalt alloy delivering a roundwound sound with a flatwound feel. Extra light gauge set for slinkier feel and exceptional playability. Great for rock jazz, blues, and funk. 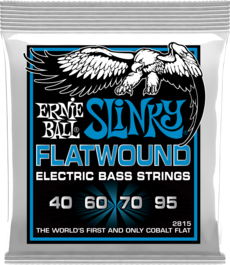 Tin plated steel core wire wound with Ernie Ball's exclusive Cobalt alloy delivering a roundwound sound with a flatwound feel. Light gauge set for slinky feel and playabiltly. Great for rock, jazz, blues, and funk. Tin plated steel core wire wound with Ernie Ball's exclusive Cobalt alloy delivering a roundwound sound with a flatwound feel. Light gauge set for balanced feel and playability. Great for rock, jazz, blues, and funk. 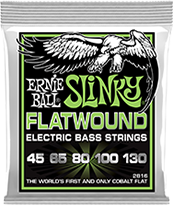 Tin plated steel core wire wound with Ernie Ball's exclusive Cobalt alloy delivering a roundwound sound with a flatwound feel. Heavy gauge set for balanced feel and playability. Great for rock, jazz, blues, and funk. Tin plated steel core wire wound with 80/20 bronze delivering a crisp, ringing sound. 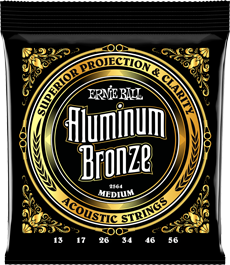 Maraging steel core wire wound with Ernie Ball's patented Aluminum Bronze alloy for a crisp, clear sound and superior corrosion resistance. Tin plated steel core wire wound with phosphor bronze delivering a warm, rich tone. 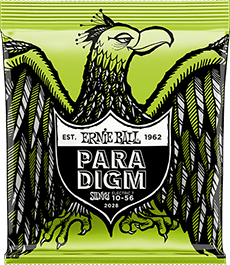 Paradigm Acoustic strings provide unprecedented strength and longer string life while retaining 100% Earthwood tone and feel. Copyright © 1995 - 2015 Ernie Ball Inc. All Rights Reserved.